Tell us a little more about yourself. What was your source of inspiration for the work you do? How did you get to where you are today? I am an Atlanta native and grew up in the Kirkwood/East Atlanta area. Although those areas are super nice now, when I was growing up, there was a lot of crime and violence there. With my parents dealing with trauma they inherited from their respective families, I grew up in a household and community where self-medication, violence, and untreated mental health conditions were the norm. Despite my home life, I excelled in my academics. I’ve had a diverse academic experience, attending a public elementary school, a public charter school, a private high school, and two elite Ivy League institutions for my undergraduate and graduate studies. Each of these schools had its own way of empowering students in the classroom. The summer before my senior year at Wharton, I interned at Goldman Sachs in New York and received a full-time offer. Though I learned a ton, I decided to turn down my offer and join Teach For America in Providence, RI in 2013 as a Corps Member. Those two years of being in the classroom and studying Urban Education Policy at Brown pushed me to really think about how the content I was teaching would be relevant to the Black and Latinx students I was responsible for. I wanted to channel my story into a solution our city could use to increase opportunities for Black, Latinx, and queer kids to be able to make a living for themselves and also have a chance at building wealth. And the way I believe we champion for this chance at building wealth intentionally is through our booming technology industry, which needs some serious accountability when it comes to ensuring more gender and racial diversity within its leadership. At honorCode our mission is to build coalitions between educators and employers to develop sustainable local workforce pipelines within K12 schools. We achieve this mission through providing curriculum and training to schools to bring computer science and social-emotional learning to the general K12 classroom. We’re engaging our local K12 educators and business community through programming where we get to talk about workforce development and how both schools and our local industries play a key role; and ultimately down the road we’re trying to ensure 11th and 12th grade students are getting mentorship and internship opportunities at some of our local firms. How we drive impact is through the teachers we train. We know we can’t shift this paradigm on our own. Whether you’re a teacher in Atlanta Public Schools, Dekalb Public Schools, Boys and Girls Club of Metro-Atlanta, Girl Scouts of Greater Atlanta , or any other in-school and after school place of learning we have in the city, we need to all be working together, and incorporating mentorship and investment from our technology workforce, to help us make the needed impact. Are there any recent developments that you would like to highlight? 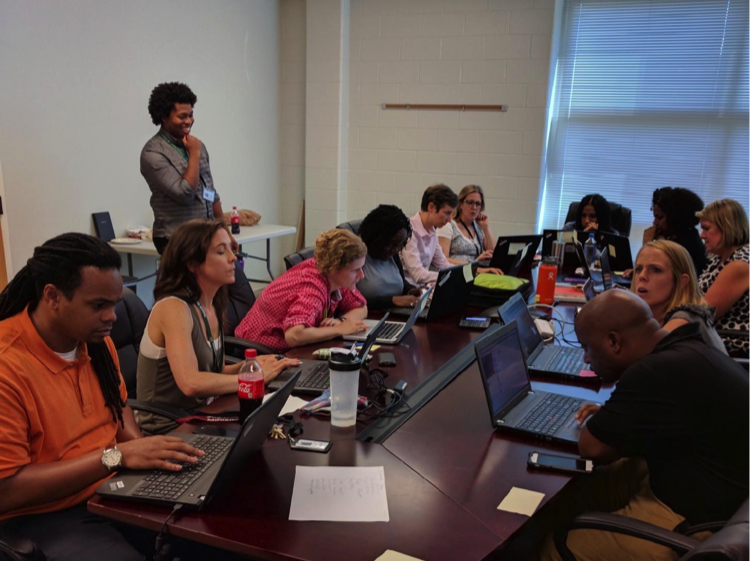 honorCode is using this next phase of our growth to start building coalitions between K12 educators and Atlanta's business community to tackle the challenges of workforce development in K12 schools. Our first event will be Monday, October 16th, 2017 at Charles R. Drew Charter School, where we will be screening the documentary CODE: Debugging the Gender Gap, and hosting a panel discussion with some of the women and people of color in technology in the city. They will be talking about what Atlanta would look like if more women and minorities could code. We will be starting to do bi-weekly programming across the city going into 2018 and will be calling on Atlanta’s business community to join us in these conversations with educators. Also, after the mayoral elections, on Thursday, November 9th we will be celebrating our 2YR Anniversary Fundraiser at Atlanta Tech Village, where we will be gathering all of our friends and supporters in the city to celebrate us impacting over 1400 students in our pilot year. We’re trying to raise a little over $50K to help us achieve our goal of impacting over 3,000 students in the 2017-2018 school year through our collaboration with Atlanta Public Schools. Lastly, between our recent partnership with Invest Atlanta, recognition on the 2017 Forbes 30 Under 30 and Wharton 40 Under 40 (to be released in October) lists, and bringing on a new team member, we have quite a bit to celebrate as an organization that has been around for just two years. The biggest challenge we have is making sure that we are taking care of the culture that has made Atlanta what it is today. With all of the influx of investments coming to our city, we have to make sure folks truly have a chance at making a living here. We also have to make sure that as companies continue to make claims here in the city, that they also make commitments to the community members who often times get displaced due to development. Our city was built on so much civil rights history and activism, and we can’t just commodify it through a museum or through an award. We have to strive to be an egalitarian city that prioritizes marginalized communities. The incoming mayor, school board, city council, and CEO of MARTA will play a huge role in what this means for our city. Surround yourself with people who can make help you make your idea happen. This work is not for the faint of heart! You have to be audaciously bold and have a community to see it come to fruition. Lastly, be sure to develop mental health and self-care routines for yourself. The work we do is very demanding and you have to make sure you are prioritizing your health first. Thank you to Jeffrey and the whole honorCode team! We're so inspired by you and the work you do. Atlanta is filled with incredible people and organizations doing meaningful work all throughout the city. Their efforts change the way our city designs solutions for the challenges we face in education, art and culture preservation, criminal justice and reform, workforce development, and food security. The Center for Civic Innovation aims to be a place that supports and showcases these community leaders to the world. We hope their stories will inform and inspire. Announcing the winners of A3C Action 2017!